Indian rap accompanies car trip | Walk with us! In this post Fr. Tom Cassidy, who is spending February with the theology community in India, writes about a recent car trip with the community to an ordination; he promises to write about that ordination in a future post. I was glad we got to the ordination early as it gave me an opportunity to meet up with some Indian SCJs I have met over the past couple of years. I was not the only foreign SCJ present. Joining in the ordination celebrations were Frs. Sebastian Pitz, SCJ (Brazil), Martin van Ooij, SCJ (Indonesia, but Dutch by birth), Jesus Manuel Baerna (Spain) and Dwijo, SCJ (Indonesia). I have spoken of all but Fr. Dwijo before. He came because one of the newly ordained is working in Gisting at his parish. Gisting is famous among SCJs for its mild climate. It is located several thousand feet above sea level, which accounts for its very mild condition (temperatures much cooler than the rest of the country). Perhaps the one downside for visitors to Gisting is that the water for bathing, which is heated only by the surrounding air, makes for, let me say, a rather invigorating morning bath! Fr. Dwijo is the parish priest, our Indonesian novitiate is also located in Gisting. 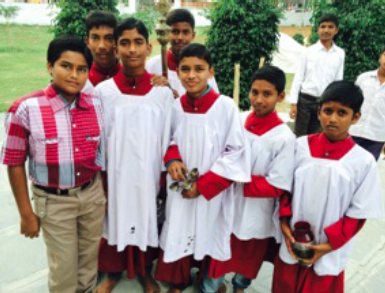 As we waited for the ceremony to begin I got a chance to speak with our altar boys (the boys were surprised when I told them that in the States we had altar servers and many of them are girls). Their English was of varying qualities; the young man in the shirt (pictured above) was my chief interpreter as he is going to an English School. He eventually got into a server’s outfit before we processed into the cathedral. Look closely to the two servers standing next to him and note the holes in their surplices near the hemline. The server who carries the thurifer (incensor) keeps the lid open and swings it back and forth. Believe me it is filled to the brim with burning charcoal. I have visions of burnt feet but they assured me it doesn’t happen, but as for burn holes in the surplice, now that’s a different story. It was fun talking to the boys. I have found that often when a stranger comes to a foreign land, especially from North America or the British Isles, young people like to ask questions and show off their command of English. Tom, Is the Indonesian novitiate in India?